Hello, and welcome to our informative and educational site. We have separated the topics into different articles. However, they are all based on one popular sport. 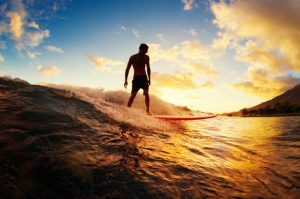 Developed in Hawaii, surfing is one of the most well-known water sports in the entire world. It is practised off coasts all over the world. The activity involves the rider standing on top of a board, and balancing on sea waves. Experienced surfers are able to ride bigger and rougher waves. It can often take years to develop and master the skills required to become an expert. The sport is most commonly enjoyed in waters that are warm, but also choppy. We have many great articles that detail the subject of surfing and issues that relate to it. We have a list of the best places in the world to ride the waves to help surfers choose the ideal destination. This section tells people which beaches are ideal for different skill levels. This includes places all over the globe from the US to Norway. This is not only useful for surfers, but also those who want to enjoy a picturesque holiday. Some people may have difficulty deciding whether to use a bodyboard or surfboard. There are several similarities and differences between them. In one article, we talk about these, to help people make the right choice for them. This part of the site will be particularly useful for people who are only just starting to surf, or even those who have never surfed at all. Above all else, we want to encourage safety when enjoying this sport. The sea can be a dangerous place, and people lose their lives every year due to making mistakes. These can be easily avoided just by being cautious. We have a section that gives some handy tips on how to stay safe while surfing. Everyone should read this so that they know what not to do when out on the water. The media often exaggerates the number of shark attacks that occur each year. These creatures are not naturally inclined to bite humans. However, these events do still happen. It is highly unlikely that the reader will ever encounter a shark while out surfing. Still, our article on sharks and surfers is helpful, so that people are aware of how to deal with this rare situation. We go into detail about the steps that should be taken if a shark bites you while you are in the water. This includes how to fight back, and get back on to dry land safely. Hopefully, the readers will never be in a position where they need this information. It is here to guide them just in case. We even have an article that discusses the relationship between surfing and the gambling industry. It might not seem like an obvious sport to place a bet on, but it is becoming one of the more popular ones. The world championships, in particular, are of interest to gamblers. We give the reader the best sites to use in this regard. The article also explains why online gambling has overtaken bookies as the way to enjoy this activity. Those who work in the gambling industry, or just bet on sports as a past time, will get the most out of this section. Together, these articles give a broad outline of the many aspects of surfing. We hope that when a person has read them all, they will have expanded their knowledge on the subject. Above all else, our site is an educational one. People who are studying issues related to surfing will have plenty of useful facts to pick from our various articles.